Your packaging design has 3 seconds to capture your audience’s attention. In the busy world of today’s modern shopper, sensory-overload rules the aisles— packaging design features buzzwords and color bursts and adorable mascots all screaming “BUY ME NOW.” The fact that consumers know your brand helps guide them through this chaotic abyss more calmly—but every now and then, brands like to shake things up. New label on the right; old label on the left. 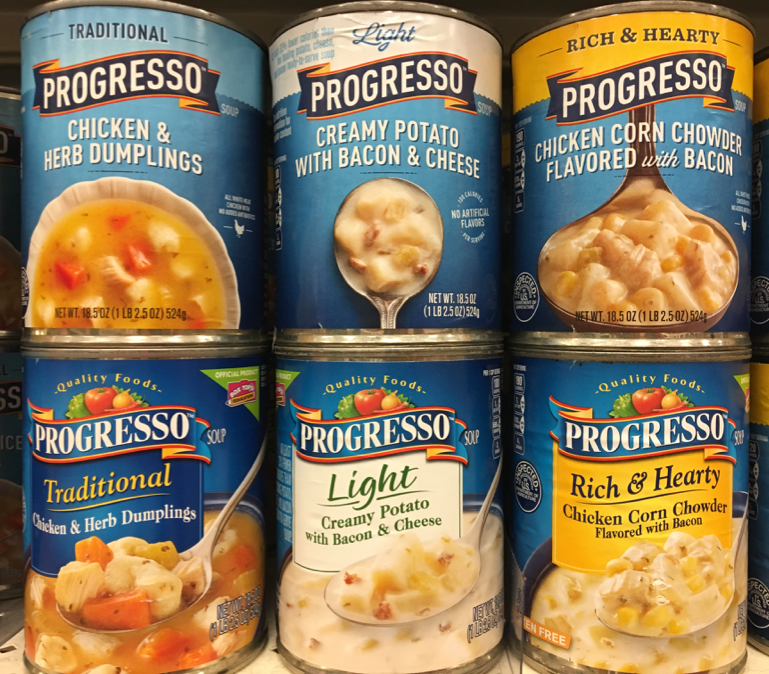 Enter Progresso soups and their latest packaging redesign: They have retained their signature blue (albeit in a bit more subtle hue) and their commanding banner namesake is still proudly displayed–only now with a more modernized flare. Updating your labels is exciting. It should be a good thing, right? It is a good thing—when properly executed. As styles evolve, your packaging design should stay stay current with the times. Those updates, however, shouldn’t work like a Witness Protection Program, hiding your identity and confusing your (possibly former) followers. Instead of a complete overhaul, there are some subtle (but very impactful) ways you can elevate your brand to shine-on with your competition and even stand out in the crowd. Somehow this soup didn’t get the sleek, modern facelift it deserved so much as it got a generic makeover. 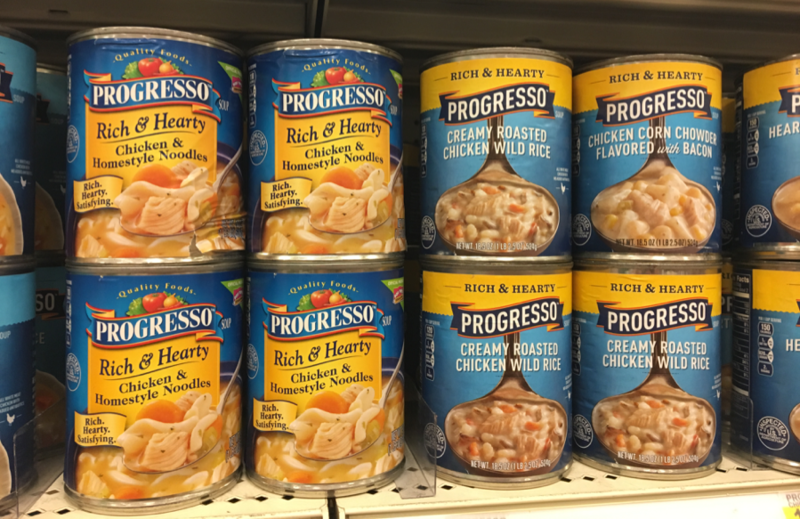 Nice new Progresso banner streamlined to remove the clutter and with a nice, modern sans serif font. I like the subtle downward bend of the flavor name and the bold, white font. It gives the label depth. This creates a little more excitement and movement on the label. It is also a larger typeface which is great! The ladle of soup is not nearly as appetizing to me as the soup that appears on the old label design. The ladle itself appears to be floating on the field of blue that gets lighter towards the middle (which seems like an attempt to make it look like the ladle of soup is glowing off the background—very zen-like). But I say, “What happened to that rich Progresso blue?” It now looks washed out like someone left this can in the sun too long. (Looks bleached? I don’t want to think of bleach and soup at the same time.) That blue is the flagship color. An anchor that lets you know that you have docked in Progresso Soup Town and you are right where you intended to be. Finally, let the newly stylized flavor name sit proudly above the scrumptious bowl of soup, unencumbered by a ladle handle that adds nothing but distraction to the overall look. I love the “idea” of the ladle, but this ladle hurts my face. New labels on top; old labels on bottom. A great, appetizing bowl of soup for all varieties, and maybe just have a different style of bowl for each. Although I am not opposed to the spoon on the ‘Light’ soup, maybe because it comes in from the bottom and doesn’t interrupt the flow. “Okay ‘Light’ version…. you can keep the spoon!” I also want to see a bold color differentiation at the top, like the yellow. Yellow is good. It’s one of the best colors for grabbing attention, which is why it’s used for many street signs. And that’s all you need—three varieties all distinguished by bowl style and color band at the top. I want to love this label. Really I do. I am a big fan of cutting the clutter from packaging and creating a more effortlessly modern look. 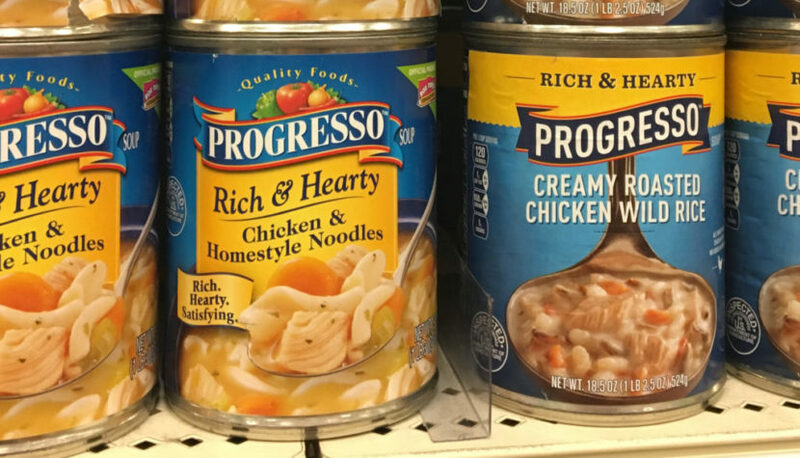 I just think Progresso missed the mark in how they tried to differentiate each variety with imagery. You have three seconds to capture your audience’s attention on the shelves­­—make them count! P.S. Sorry, Target, for rearranging your shelves for my impromptu mini-photoshoot! Need help with your package redesign? Consider contacting NewPoint! A “New Point” Focus on Food Industry Marketing Bulk…What Does It Mean For Your Brand?